Mary (Blaskie) Novick with a granddaughter. Circa 1930. One of my readers, Careen Jennings, recently submitted an extremely well-researched account of her Lithuanian immigrant great-grandparents, the Blaskie-Novicks, who lived in the Springfield area from the 1890s through the 1930s. Their son Billy Novick (1912-1928), Careen’s great-great uncle, contracted polio and until he died at 16, had to crawl everywhere on his belly because his family couldn’t afford a wheelchair. Unbelievable, but true. This huge variability in post-immigration spellings is a common obstacle, if not also somewhat unique, to Lithuanian-American genealogy, compared with researching surnames more amenable to English translation and pronunciation (Italian, for example). Where did such variability come from? Attempts at phonetic translation and truncation to comply with the norms of a new language. Widespread illiteracy among first-wave Lithuanian immigrants, as well as the lack of emphasis these impoverished immigrants, along with the officials who dealt with them, would have placed upon correctly recording their vital information. For many Lithuanian immigrant families whose surnames were permanently converted to endings like “vich,” “vitch,” and “ski” or “sky,” the issue was polonization. Some of my readers have suggested that these transformations were made in the passenger registries of ships that were carrying mostly Polish immigrants. It is also a fact that for hundreds of years under the Polish-Lithuanian Commonwealth, and even under the Russian Empire that followed, Polish remained “high” culture vs. Lithuanian and Poles the dominant nobility both within and outside the Catholic church. Under the circumstances, it would have made sense for lower-class Lithuanians, even in the process of their own national awakening, to reach for higher “Polish” status, or at the very least, to conform with it. Last but not least, there was the phenomenon of affinity. Both Polish and Lithuanian were targeted by the 40-year language ban that banned publishing in the Roman alphabet. As the Polish-Lithuanian Catholic church and its village schools also came under Russian attack during this period (1863-1904), Poles and Lithuanians had more in common than any other groups in the Lithuanian “province” of the Russian Empire. Perhaps that’s why Poles and Lithuanians also tended to settle together in the same neighborhoods after immigrating to Springfield. In any event, the incredible surname variability that Careen discovered is also an obvious tribute to the wide net she cast in her research, which involved many different dates and types of genealogy records. The story of Careen’s paternal great-grandparents shares many elements with other first-wave immigrants who arrived during Springfield’s coal boom. Lithuanians Mary M. Blaskie (1869-1938) and her husband Edward Peter Novick (1865-1936), the son of Michael Novick (Lith. Navickas?) and Anna Bagdonis, both immigrated in the early 1890s. The couple initially lived in a series of small mining towns north of Springfield: Spring Valley (Bureau County), Athens (Menard County), and possibly Cherry (Bureau County). By the time they arrived in Springfield in 1917, their 23-year-old (eldest child) Mary Louise had already married, after working as a live-in domestic servant from the age of 15 for wealthy Springfield families located on West Lawrence and South Grand Ave. According to Careen, the Novick family first appears in the Springfield City Directory in 1917, at which time they lived at 1919 E. Cook St., a home that was owned by Mary Louise’s husband, August Schmidt. This indicates that the two families were probably living together. Then in 1918, the Novicks rented their own home at 1945 E. Lawrence, where they resided until 1922, when records show they owned a home at 1808 E. Jackson. Although the house on East Jackson had no electricity or running water, the Blaskie-Novicks lived there until around 1936. 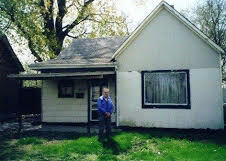 Grandson John Edward Schmidt in front of the Novick house on East Jackson. Elsewhere in this blog, I have noted that immigrants were arrested for picking up coal that had fallen along the tracks from rail cars leaving the mines. However, Careen reports that even as a child, her father John could be sent by himself with a wheelbarrow to collect fallen coal. Perhaps enforcement was more lax with regard to children, and the family knew this. Or, maybe there was some trick or quick escape any of the Novicks could employ, since they lived a distance of only two houses from the tracks. Like many coal-mining immigrant families of the time, they shared poor accommodations and needed every member who could possibly do so to work. Ed, Sr.’s, mine operated only during the heating season, from October to April, so that is the only time he had a mining income. A whistle in the morning signaled that there would be work that day. “During the summer, the family lived on odd jobs that Ed could get, what they could grow in their small back yard, and two-day-old baked goods,” Careen writes. But it was necessary for all the children to work and contribute their earnings, as well. In addition to Mary Louise’s work as a domestic servant, which required her to leave school after fifth grade, son Edward, Jr., only finished sixth grade and was working as a truck driver by age 18 and a coal miner by age 20. Additionally, Careen draws for us perhaps that saddest picture I have yet encountered writing this blog. “Billy, the youngest surviving son (two of the family’s children died in infancy), was paralyzed from polio. The family had no money to buy a wheelchair,” she writes, “so he dragged himself around with his arms, holding his head up so he could see. His mother strained herself to lift and help her dear son many times a day, which, especially as he grew into a teenager, caused her to develop enlarged veins in her neck and arms. Young Billy Novick’s grave, 1928. When I read this sad anecdote, I wonder if young Billy’s fate might have been worse in the U.S. than it would have been in Lithuania, where isolated in the countryside, he might never have contracted polio. Careen’s father John Schmidt (son of August and Mary Louise (Novick) Schmidt) and his sister were often cared for by their immigrant grandparents Edward and Mary during the 1920s. Careen reports that this was while the children’s mother Mary Louise, who had once worked as a domestic, now worked as a waitress at the Abe Lincoln Hotel, where many prominent politicians of the time dined. Careen continues, “Even when John was 88, he still remembered a Lithuanian sentence that translates: ‘Be good or I’ll beat your bottom.’ Children and grandchildren of immigrants had to learn that life was tough. John also learned to swear in Lithuanian, doubtless from his grandfather. By the 1930 census, immigrant Ed, Sr., was no longer employed due to mining-related lung disease. According to this census, although both Ed and Mary could speak English, neither could read or write. Neither had become naturalized U.S. citizens. Careen writes: “John remembered his grandfather Ed sitting in a rocking chair on their small front porch on Sundays, happily drunk and singing Lithuanian songs. He made his own beer, skimming off the froth on top to taste as it brewed. He had no social life (‘never went anywhere’) and probably had little else to bring him joy. “When he spent the night at the Novick house, John remembered his grandfather coughing all night and spitting into a bucket of ashes. After twenty years in the mines, Edward was disabled by several chronic lung diseases. He stopped working in July 1928—the same month that son Billy died—and lived for eight years unable to work. Immigrant Mary’s brother William was also a miner who registered for the World War I draft on June 5, 1917. His birthplace was listed as Marijampole, Lithuania, from which he arrived in the U.S. in 1911. On the 1920 census, he stated that he had applied for U.S. citizenship, could speak English and owned a home with no mortgage. William Blaskie worked as a “shot firer” at the coal mine, or a “blaster” who used black powder to bring down the walls of coal from 5 to 11 p.m. at night so that chunks of coal could be loaded by crews on the morning shift. The dangerous nature of his job might have resulted in higher pay and could have accounted for his home ownership so soon after immigration, Careen writes. Editor’s Note: Careen’s father John Edward Schmidt (1916-2005) grew up in Springfield but spent his late childhood in Bluffs, Ill. He served in the Navy during World War II, and after the war, he built a motel in Decatur. He spent the rest of his working life in the motel business, his second and last motel being the Intown in Decatur. According to Careen, John retained strong ties to Springfield throughout his life because his parents August and Mary Louise remained here, along with his only sibling, a sister. A Decatur native, Careen remembers many a Sunday spent with relatives in Springfield. She left Illinois for college and eventually ended up in small-town Eastern Connecticut, where she taught high school for nearly 40 years. What a great window into Lithuanian life of the time!